I picked these hubcaps up at a yard sale a week ago. 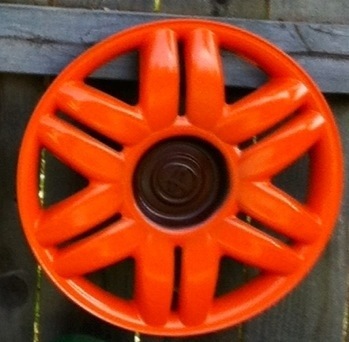 I have been keeping a lookout for hubcaps every since I seen the yard flowers made from hubcaps on HomeTalk. 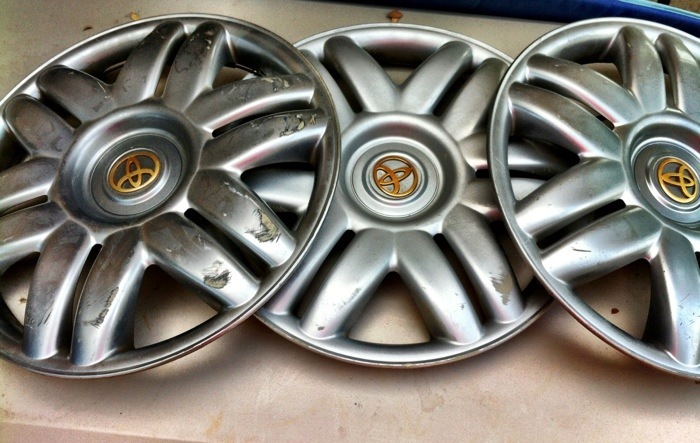 First wash your hubcaps with soap and water/degreaser. Cut out a piece of cardboard the size of the center of the hubcaps. Place in center of your hubcap. 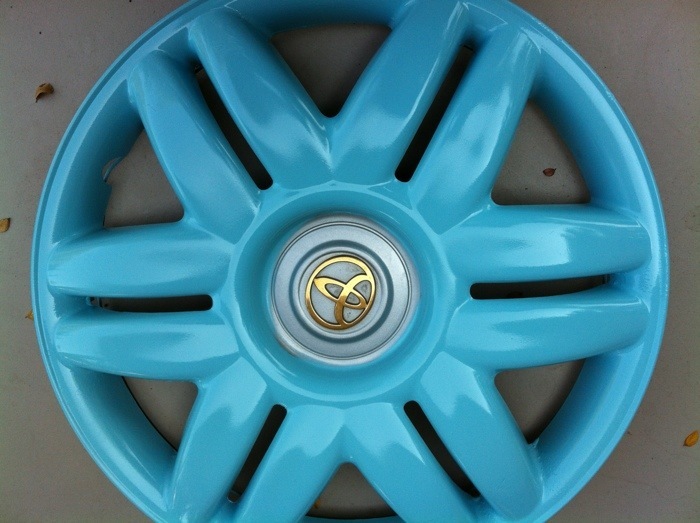 Now spray paint hubcaps the color that you want your flowers to be. 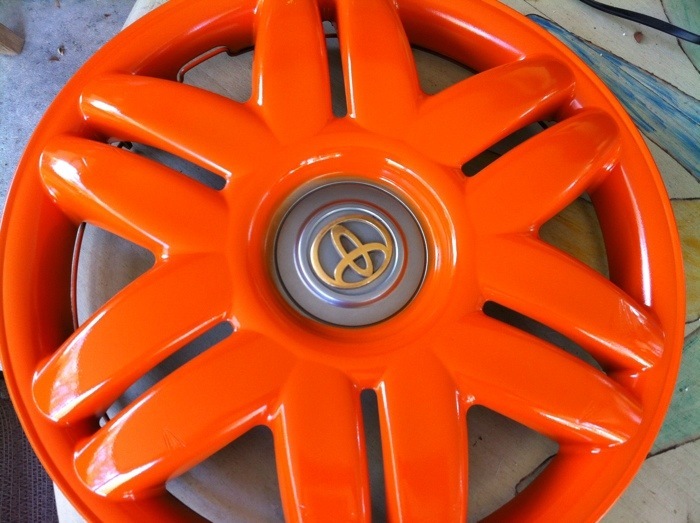 Now use cardboard or paper to cover hubcap, but leave the center part open and spray paint it black or brown. 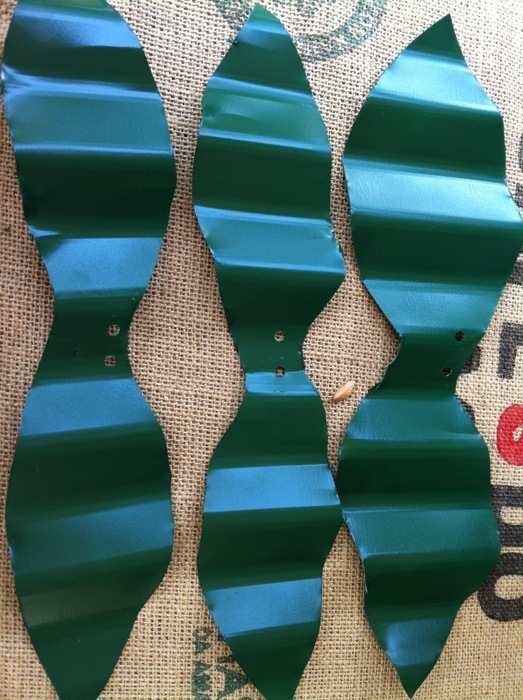 I cut out some leaf shapes from a piece of left over corrugated metal I had. Punched two holes in the center, and spray painted them green. 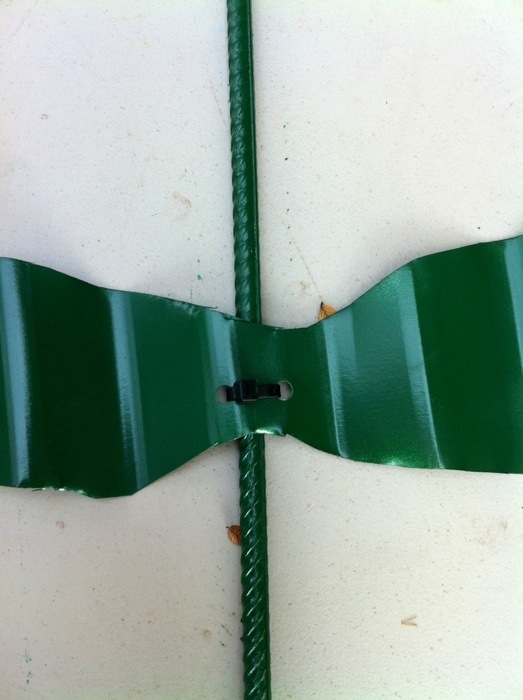 Then I connected them to some metal rebar (the stems) that I painted green, using large zip ties. 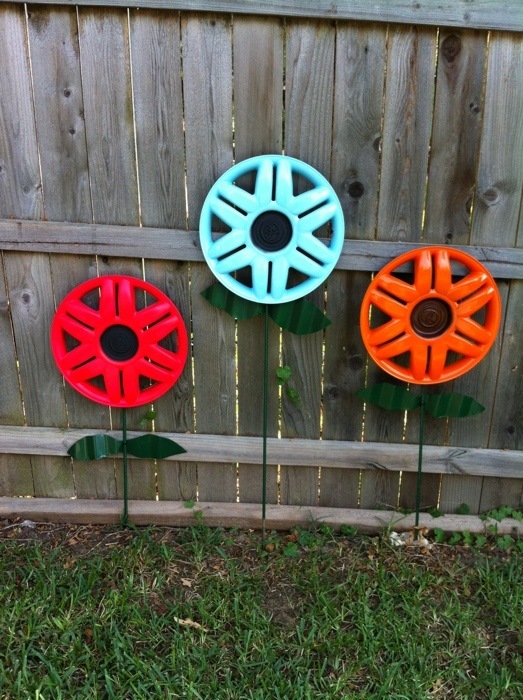 I zip tied the rebar to the back of the hubcap flowers, then used screws to help hold them steady against the fence. (There top heavy). I love the orange and blue flowers but not the pink. (Looks better in picture). I used paint I had on hand. The pink was fluorescent, and it did not cover as well. I think I will buy a regular color of pink and redo that flower. 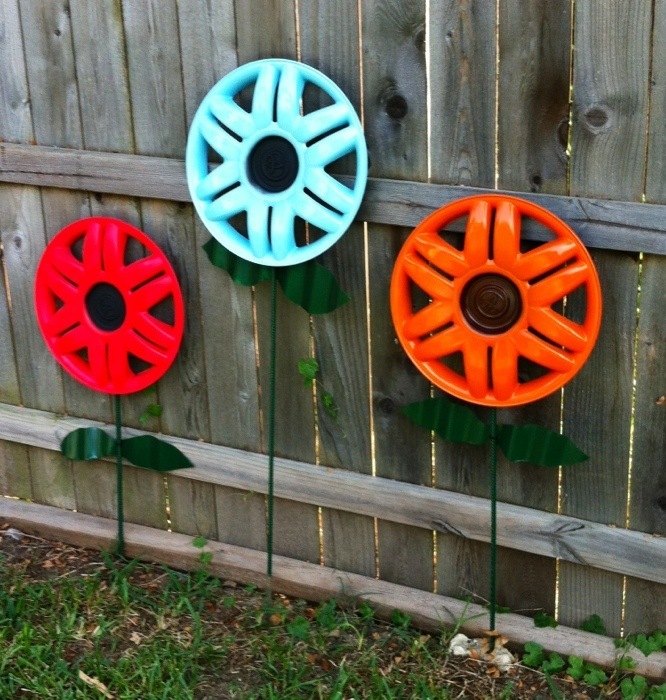 How do you like my hubcap yard flowers? I think that the stems and leaves are to small for the flowers. What do you think? Hi Audra! The back of my hubcaps has some slots where I was able to slide the rod through the slots then I wired them down to help hold them in place. I painted the hubcabs after cleaning them up. ABout three months later the paint peeled off during the weather . How to keep the paint stay on? Any special treatment to keep the paint intact on the hub caps? I used spray paint that I had on hand, then I just sealed with a clean spray paint sealer. Rust-o-leum has a good sealant. Mine weren’t in full sun all day, so I don’t know if that helped or not. I know the sun it hard on things. Everything I put out whether on my fence or free-standing, I use the Rust-o-leum clean laquer and they last for years. I have a big B out of wood that is on my fence and this is the 3rd year and it looks as good as the day I put it up. If I am doing another project that needs the clear coat, I always go back to the B if there is any left over and give it another quick coat. We’ve recently started using the Rust-o-leum clean laquer as well. So much easier to use. Thanks for stopping by! You would need to use some sand paper to rough up the slick surface so the paint can adhere better. You might consider using an oil base primer prior to painting after sanding also. Love the artwork. 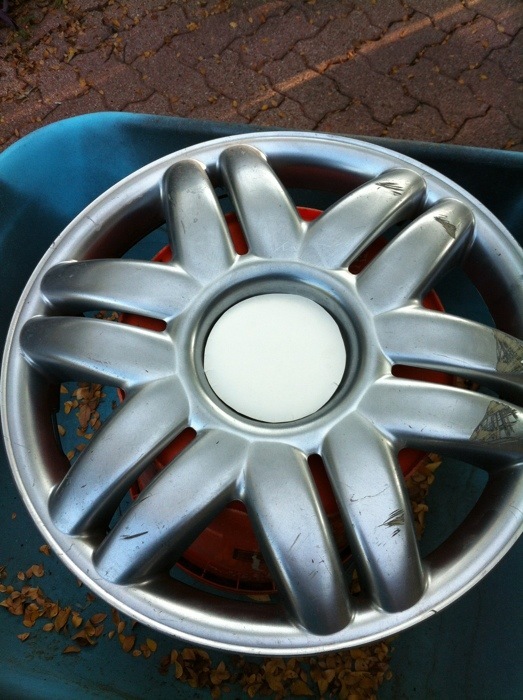 I have been searching along the roadside for hubcaps to do this also. What kind/brand of paint did you use and did you seal them with anything? Where I want to place mine will be in full sunshine & don’t want them to fade. Thank you. Thank you Angie! I used spray paint that I had on hand, then sealed it with clear spray paint as a sealer. Rust-O-leum I believe has a sealer. Hi Paula! Would love to see yours when your done with them! Thanks for stopping by! Those are going to be so pretty Crystal! I think that a broom or rake handle will work just fine for the stem. Using lawn furniture spray paint is a great idea! Hope to see it when you are done. Thanks for stopping by! I seen these in Lancaster, it looked like they used a green water hose to shape the stems and leaves. They were beautiful !its a great idea, I enjoyed your post! Getting ready to do the side of my garage. I haven’t seen those with the water hose, but I bet that would look really nice. Thanks so much for stopping by!